This entry was posted in HOME Posts Uncategorized and tagged past on March 11, 2015 by arc_berkeley. The Questioning Aesthetics Symposium takes up the term aesthetics as both the subject and object of critique, and as a way to explore and expand new forms of aesthetics research in many disciplines. 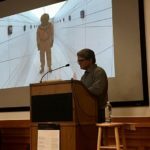 In relation to the evolving conversations around participation, computing and the contemporary, scholars and artists from around the US will come together for a day long symposium on Friday, March 13, 2015, to discuss the changing state of interdisciplinary art relations and question blind spots in the field. In preparation for the symposium, our panelists have shared introductory literature to frame the conversation. 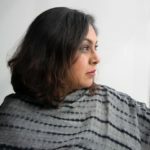 In an Interview with Art Practical, Shannon Jackson discusses the expanded field art practice and the intersections of the aesthetic and political. Franchesca Pollenta sketches the contemporary enthusiasm for participation that reaches across business, education, popular culture, and politics. 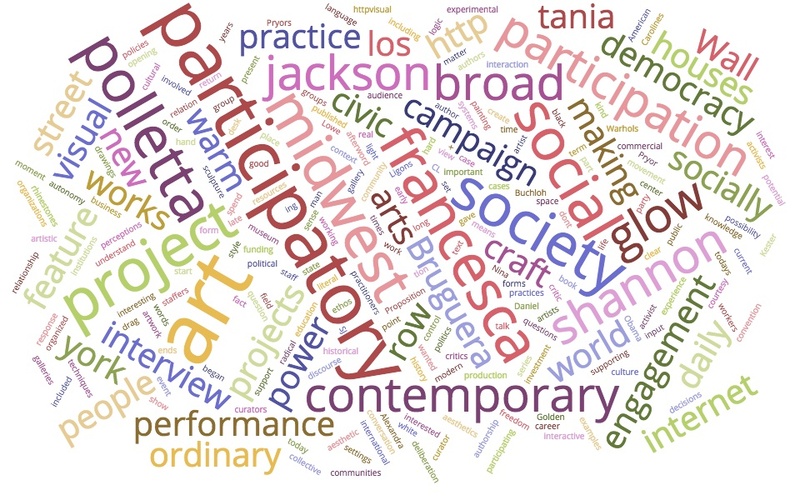 Tom Finklepearl discusses the ethics and aesthetics of participatory art while Dee Hibbert-Jones share’s Tania Bruguera’s Reflections on Useful Art and Jen Delos Reyes contributes A Contract Proposal for participatory art practice. 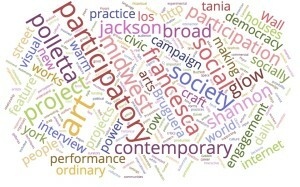 Sharon Daniel discusses two database-driven hybrid forms of art, scholarship and activism. Michael Kelly, Editor-in-Chief of The Encyclopedia of Aesthetics, shares an excerpt on data visualization and Edward Shanken’s contribution to the encyclopedia investigates the computing aesthetic. Richard Meyer asks us to consider what “was” contemporary in art and Julia Bryan-Wilson questions craft’s place in the contemporary. SanSan Kwan shares Andre Lepecki’s discussion of dance as a practice of contemporaneity and Jeffery Skoller discusses the aesthetics of experimentalism in film and video art. The Questioning Aesthetics Symposium has served as a jumping point to begin crafting an interactive research bibliography on these developing fields. As part of the ARC Reads series, we invite you to join the Arts Research Center Zotero Group. Explore the full reader index and share your questions and comment on the expanding field of aesthetic inquiry. The threads of these conversations are central to the research goals of Arts Research Center. 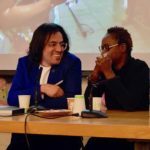 In a curated selection of our archive we reflect on how these questions have resonated through conversations about art and social change, art, the relationship between art and STEM fields and inter-arts inquiry. Finally we invite you to explore ARC Picks, a directory of related events around the bay in order to see this conversation in practice.